Seattle is no stranger to wet winters, but usually it falls as drizzle, mist, and other forms of liquid precipitation. This week, though, more than a foot of snow has turned the Emerald City white. So what gives? The recent spate of storms are following very abnormal tracks that have tapped deep Canadian cold. And yes, the polar vortex may even be playing a role. To understand what’s weird, you have to understand what’s normal. Seattle does get about six inches of snow a year, but a sustained run of storms like this is rare. According to the National Weather Service, Sea-Tac airport has picked 14.1 inches of snow as of Monday morning, making this the snowiest February recorded there since record keeping began in 1945 and the eighth-snowiest month, period. With more flakes expected to fly on Monday evening, February 2019 could climb even higher in the record books. Storms usually flow over Seattle from west to east, passing the Pacific Ocean and Puget Sound. Those bodies of water usually hover around 50 degrees Fahrenheit in winter because the ocean reacts very slowly to temperatures changes as opposed to the air. Though you wouldn’t necessarily want to take a dip in water that cool, they’re still warm enough to act as a moderating influence on the land temperatures immediately adjacent and storms passing over them. That’s why Seattle gets a lot of drizzly days and the western side of the Olympic Peninsula has the only temperate rainforest in the Lower 48 despite being on the same latitude as Caribou, Maine, a bastion of cold and snow. It’s also why the snow that does fall in the mountains tends be heavy and not-so-kindly referred to as Cascades Concrete as opposed to the fluffy powder of interior mountains. To get snow, you have to get cold. And to get cold, you have to get air from Canada. And that’s exactly what’s been happening for the past week. Storms have been coming in almost directly from the north, tapping chilly air from interior British Columbia. That’s caused Seattle temperatures to dip 20-30 degrees Fahrenheit colder than normal or well below freezing. 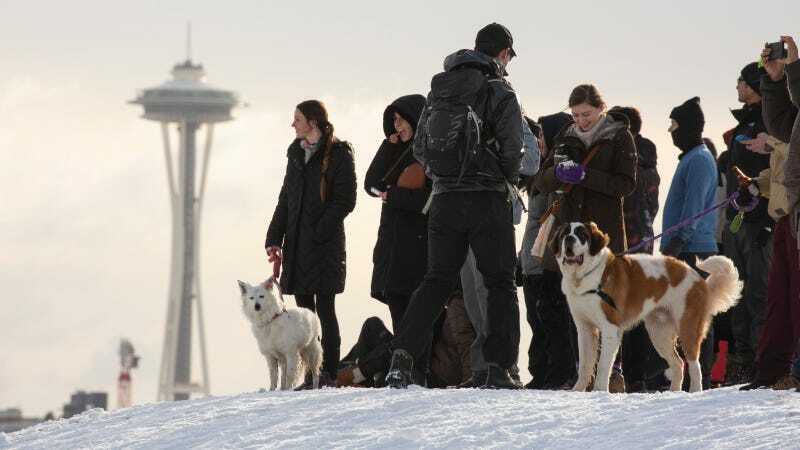 And that’s how you end up with people skiing down city streets and the photo at the top of this post of a majestic Saint Bernard on a snow mound in front of the Space Needle. The rest of Washington has also suffered from cold and snowy conditions. Mount Rainier, for example, recorded winds in excess of 100 mph and wind chill values of minus-47 degrees Fahrenheit while Snoqualmie Pass picked up nearly two feet of snow on Sunday alone, according to the National Weather Service. Judah Cohen, an atmospheric scientist with weather and climate research group AER, a Verisk Business, told Earther that the polar vortex breakdown that started in January and brought Arctic temperatures to the Midwest a few weeks ago could have played a role in helping the cold air leak down into the Northwest as its slid further west. He also noted that 1968-69 was the snowiest winter on record for Seattle. His research also shows that the recent run of winters with polar vortex breakdowns could become more common as the planet warms. The parade of storms is expected to continue this week, though the next one will add a wrinkle to the forecast by taking a more traditional(ish) track. The fringes of the system are already buffeting the coast as it drops in out of the northwest. That pass over the ocean could warm things up just a bit albeit it’s still capturing a bit of cold northern air. That tug-of-war between warm and cold makes the forecast a particularly tough one snow-wise. The National Weather Service Seattle office tweeted that “[o]n a difficulty scale of 1 to 10, this afternoon and evening’s forecast remains near a 10.” Seattle could pick up another inch or two before changing over to miserable, cold rain. And more storms are coming later this week, giving this February’s snow a chance to continue reaching new heights.